So after being out west, what's left but to head east. After taking care of a few items of business and getting our taxes done, it was time to head to NYC to deliver Jonathan's belongings. We had promised him that when we got back from our winter trip we would come out with his stuff. So Saturday morning we headed out in our trusty Expedition pulling a U-Haul trailer. Saturday's driving was uneventful, and we stopped in Roxbury, New Jersey for the evening, which is about an hour outside of Manhattan. The next morning we were awakened to the sound of rain, and lots of it. We of course chose the weekend that a Nor'Easter arrived along the east coast. We were a bit nervous about navigating through the city but thankfully our Google map was correct and very helpful and we arrived at Jonathan's apartment in Brooklyn safe and sound, if not a bit soggy. We had to unload in pouring rain, but with Jonathan, Laura, Judy, and I we were done quickly. Thank goodness for only one flight of stairs. Jonathan and Laura wanted to go to the Ikea, store, so after returning the trailer, we drove out to Long Island. Did I mention it was raining? This was not a Portland drizzle, this was a downpour with 40 to 50 mph winds. We were glad to be riding in the Expedition. Even so ,the car got hit by a few flying tree limbs and it took out the right front turn signal housing. Shopping done, we went back to the apartment and helped Jonathan assemble his Ikea purchases. Then we were off to Manhattan. 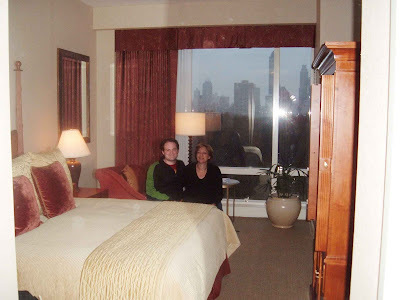 Jonathan works at the Trump International located at Columbus Circle and Central Park and had arranged for us to stay there at a great rate. All I can say is, you should either have deep pockets to stay at this place, or have a son who works there. 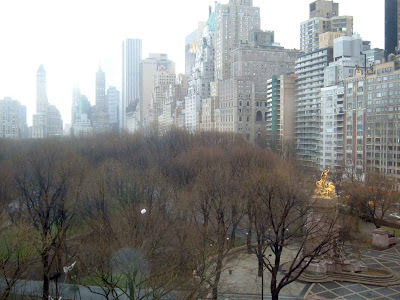 We had a great 1 bedroom suite overlooking the Circle and Central Park. What the pictures don't show is the 2 bathrooms and the full kitchen. We ended Sunday by taking Jonathan and Laura out for dinner at an incredible Italian restaurant and enjoyed a great meal. Monday we went out sightseeing with Jonathan while Laura was at school. We rode the subway all over Manhattan. It sure helps to have a guide. 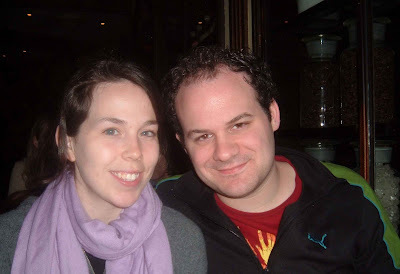 Laura joined us for a dinner at their favorite Thai restaurant in Union Square. To finish off the great evening we walked over to “Chocolate by the Bald Man” for dessert. This place is incredible. If you like “real” chocolate this is your place. Tuesday we walked down to Times Square and had lunch at the famous Carnegie Deli. The sandwiches are huge. Our Jewish mother waitress provided ample boxes for Jonathan to take home our leftovers. She wanted to make sure he had enough to eat later. I think he left with at least 2 pounds of corn beef and Judy's leftover cheese blintzes. Jonathan wanted to send back T- shirts with us for his former co-workers back in Michigan, so we went in search of “I love NY” shirts. He found some for the bargain price of 5 for 10 dollars. After that it was time to say good bye and get on the road so we walked back to the hotel to get our car and Jonathan hopped on the subway to go back to his apartment. An hour later, we were out of the city and on our way home. So what's New York like? It's big, busy and sometimes you feel like a rat in a maze. At the same time the culture, the entertainment and dining is certainly exciting. It's a fun place to visit but I don't think I'd want to live there. It's bittersweet leaving your son in the big city. On one hand we worry about him, and at the same time we are proud that he's making his own way.. No matter how old he gets, he will always be our son and...... we will always be his parents. awwhhh...so sweet! what a great little weekend holiday. 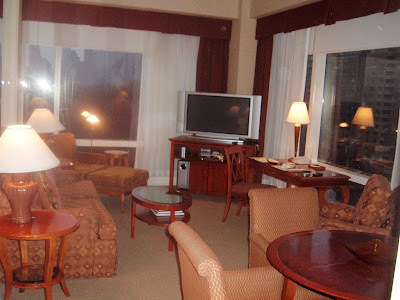 of course, i am very jealous of the accomodations...is that a plasma t.v. in the background? 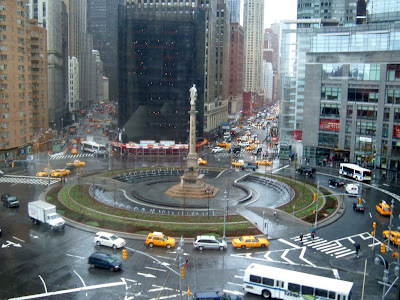 love the photos of your view from the hotel.